Every dinner party should start with some nibbles and drinks. Our ‘go to’ nibbles have always been posh crisps but now, on SCD, potato crisps are out of the question and most shop bought nibbles contain illegal ingredients such as sugar and starch. 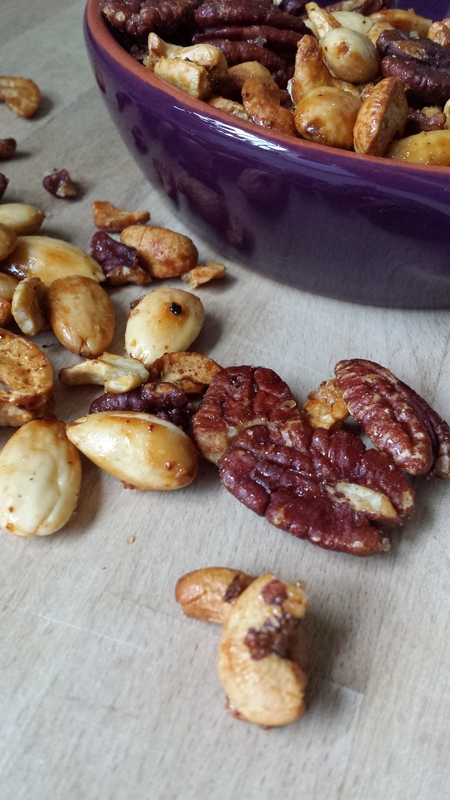 Every SCD kitchen probably has lots of nuts in thepantry and I have been experimenting to find the best result. I love the sweet and salty flavour combination so that’s waht I went for. Heat the oven to 150°c and line a large baking tray with aluminium foil. In a small saucepan on a medium heat, gently melt the butter with the honey, chilli and cooking salt. Measure all the nuts into a large mixing bowl, pour the melted butter-honey mix ontop and mix thoroughly until all the Nuts are covered. Sprinkle the pink salt and mix again, then tip the nuts onto the lined baking tray. Roasted for 7min, mix well and roast for another 5min. It’s important to keep your eye on the nuts as every oven is different and you don’t want them to burn. Remove from the oven and mix thoroughly again. Aa the nuts cool they might stick, so keep mixing them every few minutes.